This module is to create little content with icons or images including background and font style. Its extremely easy and time-saving and can be used in any web pages. Title : Write the title text of the blurb. Link : Provide the url link you want to redirect the user into, at his/her mouse click action on the blurb. Open New Window : Enable or Disable opening the URL in a new window. Use Icon : Enable or Disable an icon to use for the blurb by simply set Yes or No on this option. If you set Yes, it'll allow an option below this to choose the right icon from plenty of icons. Image : You can use a background image of your blurb with this option by simply click on the Upload Image button beside this. Image/Icon Placement : Set where you want to place the icon/image. Animation : Define the animation effect to apply on the blurb. Animation Delay : Set the delay of the selected animation. Content : Write the blurb detail content text in this area. Content Alignment : Set the Content Text alignment. Header Font : Customize the Header Font for the Blurb. You can choose from plenty of existing Google fonts and define its type ( Bold, Italic, and Underline, Uppercase, Lowercase, and Capitalize as well ), size, line height, and letter spacing. Header Text Color : Choose the color of the header text. Header Margin : You can define the amount of margin in pixel for Top, Right, Bottom and Left as well for the Header. Content Font : Set the font style of the content text. Content Text Color : Define the color of the content text. Background Color : Set the Background Color of the content text. 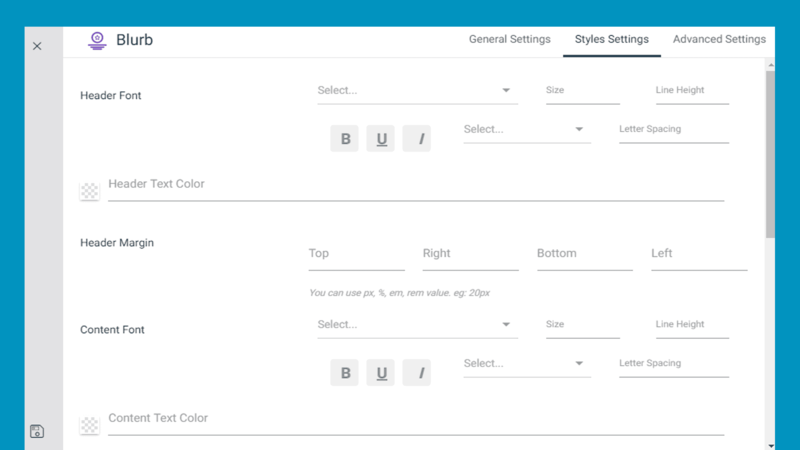 Background Hover Color : This option allows you to choose the content text background to hover color that means when the user hover the mouse pointer over the content text, in which color it would be transformed into. Background Image : You can use an image as a background with this option. 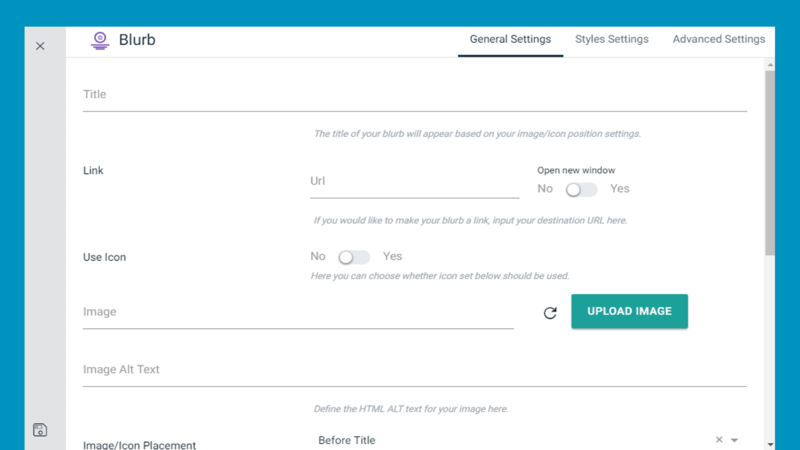 It allows you to upload an image to as set the background by simply clicking on the UPLOAD IMAGE button. Media Margin: You can define the amount of margin in pixel for Top, Right, Bottom and Left as well for the Image/ Icon you have used. Use Border : You can Enable or Disable the border by setting Yes or No on this option. Margin : You can define the amount of margin in pixel for Top, Right, Bottom and Left as well for the Blurb section. Padding : You can set the amount of padding in pixel for Top, Right, Bottom and Left as well for the Blurb section.